If you play squash or know someone who plays, you know how obsessive they can get about the sport. Here are some gift ideas for the squash obsessed in your life–maybe yourself . . . I’m always adding more as I come upon them, so check back occasionally! – Stocking stuffers for squash lovers: These are always on my wish list! – Gift certificate for any of the above! – Lessons! I don’t think I’ve ever met a squash player who didn’t want (or need) lessons. Even the best of the best admit that there’s always something more to learn and/or to perfect. And for those just starting out, there’s no better way to learn the game — before you learn bad habits! For those of us who have already learned them, lessons give you hope that you’ll replace the bad with the good. Call your club’s pro and set one or some up. Or ask to meet and talk with them about what you’re looking to achieve. Or ask around; some pros only teach club members, but some can teach non-members, so do a little legwork. Every pro teaches differently, so find one who speaks your language….although learning new languages can be a good thing. – Eye protection! This is a MUST for every squash player. 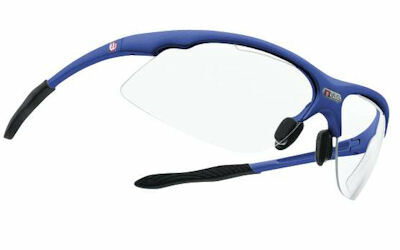 There are too many tragic tales to tell about players getting hit in the eye with a ball or a racquet; when you wear eye protection it makes the difference between having to buy another pair of glasses or having to go to the emergency room. There are tons of styles and kinds to choose from, so you can make a fashion statement as well if you wish. Buy them for your beloved if you want to keep seeing their baby blues or browns in as good as shape as their bodies are from squash. I bought some good lookin’ gold ones from here, but this chart is a great way to compare features. Personally, I need vents in mine or I start hearing foghorns. – A Buff headband (sweatband) is one of my favorite squash accessories. I used to wear cotton bandanas around my noggin, but during a long match I can go through three of them. Enter the ‘buff’ which is a stretchy circle of wicking stylishness. You can wear them in a million ways, including the ‘pirate’. I got one in lieu of a t-shirt on a ‘turkey trot’ race over Thanksgiving and it’s the next best thing since terry wristbands. Jack Rabbit Sports sell them in NYC, as does REI, and also online at BuyaBuff.com and Sahalie, where the price drops the more you buy…. – A sure fire way to get on a squash player’s good side is to get them a whole box of Dunlop double yellow dot squash balls (the standard for international softball). And their squash partners/opponents will love you, too. Why? Because a squash ball only lasts for a match or two and once it gets shiny, it really should be retired. But it ends up being used a lot longer because we rarely have a new one on hand. That’s why every squash player should have a box or two of these babies in their locker. Order a box (dozen balls) or two and we’ll love you until the last ball breaks. You can get them online or maybe your local pro shop will give you a deal? – Shoes: I love my Asics Gel Domain 2 shoes in Diva Blue (and more recently, in Red Pepper). I have highish arches and medium to narrow feet. They lace up nice and tight, feel secure but light, and let me change direction quickly. I almost forget they’re there…until I look down. Most importantly, they make me happy. I recently bought my second pair online, but if you can find them at an independent store, all the better. Oh, and they also make them for guys in Navy and Lightening (!). Or if you want to get into the holiday spirit, a pair of Gel-Cyber Sensei tomato red ones will rival Rudolf’s nose. – Oh my god, a massage! Squash players may love to hit the ball, but playing squash beats down the body in a thousand ways. Our quads, our glutes, our backs, our traps, our triceps and biceps — they all are used and often abused during squash. Stretching helps, but there’s nothing like a great massage to help make a body feel better–especially if you’ve played a little more than you should’ve. Want to make your squash mate love you forever? Give the gift of ahhhhhhs. Some clubs have their own massage therapists, but if yours doesn’t, ask other athletes for recommendations. I usually go for the deep tissue or sports massage. As they say….it’s hurts so goooood. – Doubles racquet: A few years ago, I discovered hard-ball doubles and fell in love with it, but I had no idea that you really need to play with a racquet suited for a bigger court and a faster ball. So I played with my tear-drop shaped singles racquet…until my arm started aching…a lot. 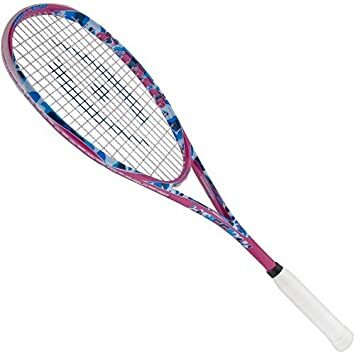 Then a friend pointed out that if I didn’t want to get ‘tennis elbow’ and wanted more power and to place the ball better, I should get a racquet with more stiffness and strung tighter. There’s more helpful info on Squash Galaxy’s website about how to choose a doubles racquet. I lucked into a flashy Harrow Jewel a few years ago. Alas, Harrow no longer makes it, but their Stealth Camo is pretty sweet looking and seems similar. – Wristbands: I sweat. A lot. 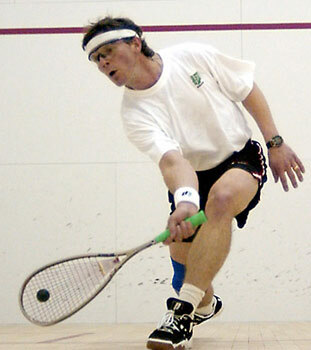 Some say it’s healthy, but when I’m playing squash all I care about is that my hand sticks to my racquet grip. These babies do the trick. And they come in great colors. Get a pack. Get a dozen. You can never have enough. I got mine here, but I may try these cool neon colored ones next! Squash TV: So you can’t get enough squash? And you can’t get to every pro squash match, but want to? Here’s your ticket: Squash TV! Watch pro matches from the comfort of your living room on your big screen tv or perhaps hiding from visiting in-laws and sneaking a peak on your tiny tablet. Here’s a taste of what you’ll see: Ashour and El Shorbagy battling it out in the World Championships…..and more info on how to order here. – DVD of “Keep Eye on Ball: The Hashim Khan Story,” a documentary film about the first great legend of the sport of squash, Hashim Khan who grew up in Pakistan, taught himself to play squash in an open-air court, and went on to win the British Open seven times. Hashim is a gregarious and charismatic figure and what makes this film so engrossing. To know Hashim is to know why the Khan family dominated squash for decades. The film is available for purchase on DVD at squashgear.com . And it’s produced and directed by Josh Easdon who runs a terrific Junior Squash Program in NYC. – Book: Run to the Roar: Coaching to Overcome Fear by Paul Assaiante and James Zug (author of the classic Squash: A History of the Game). Leading the Trinity College squash team to twelve straight national championships and a record 224 consecutive matches, Coach Paul Assaiante describes the finals of the 2009 national intercollegiate team championships and what it takes to coach young men from all over the world. Much more than a coaching book, it’s also a very personal and emotionally powerful story. Great for squash kids, parents, and coaches of any sport, but also for anyone interested in this squash dynasty. Fascinating. For full review of the book, see my post Obsession, Addiction, and Reading a Book About Both. Wheels! And if you want to make someone really, really happy for Christmas, Hanukkah, Kwanzaa, birthday, anniversary, or just because you love ’em, consider these wheels to get to and from the squash courts. vroom! vroom! the wheels of my dreams…. A yellow mini cooper with racing stripes goes well with a double yellow dot squash ball, the stick shift is good for your eye-hand coordination, it parks fast when you’re late to your game, and has plenty of room for you, your partner, and a few gear bags. While I don’t expect one under my tree anytime soon, I can always day-dream as I ride the G train home from the courts…. Stick shift and a good sound system, Santa, pretty please. Got other ideas? Reply below! Find little things to make your mane even more smashing. Go Buff. A Fitbit is also a great gift for those mad about squash. I have started to use one and find it helps me keep my energy up if I’m wearing one when I play – as I can tell after the match if I have been slacking! They are pretty accurate in terms of measuring heart rate during a game (I did a comparison here: http://www.squashleagues.org/blog/index.php/2016/05/06/heart-rate-tracking/ if any readers are interested). I use a Fitbit Charge HR. Thanks for the great suggestion, Barry. I’ve never used a Fitbit, but coincidentally just received one as a gift. So I’ll have to try it out on the squash courts!